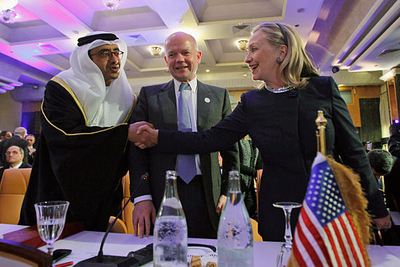 UAE Foreign Minister Sheikh Abdullah bin Zayed al-Nahya, British Foreign Secretary William Hague, and U.S. Secretary of State Hillary Clinton at the "Friends of Syria" conference. Since the end of the cold war, many Americans have a sense of being so strong, they don't need to think about their own security but can afford to focus on the immediate humanitarian concerns of others. This leads to a sentimental U.S. foreign policy of "war as social work" in which the welfare of peoples with an admittedly wretched record as American allies (Afghans, Iraqis, Libyans, Syrians) can trump national interests. In fact, American interests often diverge from those of Middle Easterners. For example, as I put it six years ago, "when Sunni terrorists target Shiites and vice-versa, non-Muslims are less likely to be hurt." Applying this approach to the crisis in Syria: Good news that the abominable Assad dynasty is coming to its end. Better "the devil we don't know" than more of a totalitarian regime that oppresses its people, threatens its neighbors, and provides crucial assistance to the mullahs in Tehran. The less the regime can make trouble for its neighbors. The more potential for Iranians to take inspiration and rebel against their rulers. The more Sunni Arabs anger at Tehran. As Syria analyst Gary Gambill puts it, "What's wrong with the status quo of an Iran chained to a Syrian corpse?" The more they anger at Moscow and Peking. Further, the overthrow of the Assad regime will not automatically end the country's civil war. More likely, that will reverse the dynamic, with Alawi and other rebels next fighting a Sunni Islamist regime. Zuhdi Jasser responds: "The only way to Defeat Islamism in the Region- a Muscular Liberty Doctrine backed with action not just words"
1- American soft power is all but disappeared, and if we do nothing the Syrian people will long remember that Islamist nations (KSA, Gulf states, Turkey et al.) helped them when we did not. If we help them beyond just words, it will give us credibility with the Syrian street beginning to correct their perception that we always just pick the worst of two evils and end up fueling their oppressors. 2- Your argument is essentially an isolationist one and that somehow we should leave Syria alone to its internal strife. That would be understandable more so if Syria was in a vacuum but it is not. Thus American isolationism with Syria translates into surrender to Russia and Iran and China (to a lesser extent). They are heavily involved from billions and sanction circumventions to weapons to actual forces. Our inaction is basically surrendering Syria to that side of the equation and giving them unfettered access to allow Assad and his genocidal military machine to continue killing. Stemming the killing, preserving some semblance of a Syrian civilization against these power structures could not be more in our interest with regards to our influence and moral standing in the region and on the ground. 3- Lincoln described the US as the "last best hope on earth". In disagreement with your position, and having served in the Navy, pretty much every officer I ever knew in our military does feel that we have been blessed with freedom and there is a moral need to do our best to stem killing fields when they occur and at least give balance against evil in the world, not only for American interests but for the interests of individual rights and liberty. Will Al Qaeda have a hand up? Maybe. Will Islamists maybe. Maybe. They've all had a head start and fueling by these very dictators who claim them to be their enemies. These radicals came out of this tyrannical environment and we cannot defeat them militarily. Assad's machine only understands force and we Syrians long knew that since the late 50's. But Islamism's defeat needs moral transparency and it starts with our approach to tyranny. That was how I approached the defense of our occupation in Iraq. If we defeat Islamists globally , it will be only in the marketplace of ideas; which your approach hands over to Islamist nations who engage while you suggest disengagement. They hypocritically are helping the opposition but clearly are doing so for the advancement of Islamism. Our work at AIFD and elsewhere cannot work in an autocratic, corrupt environment. So if you want liberal Muslims to succeed we need to stand with them and take sides. Generational change will need the building blocks of democracy and will be a mess. Fouad Ajami in the WSJ and elsewhere has been articulating this pretty well also. 4- We need a consistent moral transparent approach to our positions on regime change or else American soft power will not only wane further but we will be perceived as ineffective hypocritical moral arbiters and only selfish Americans. "Letting them kill each other" (to paraphrase what you've written) is what my family struggled with when Hama, Palmiyra and other massacres happened as the West sat silent. In today's age, the excuses of 1982 no longer exist for America. Now we ignore it with eyes wide open. 5- Lastly, the most important argument to me is the "moral obligation" argument. I do believe we are all accountable for how use the gifts God has given us to repair the world no different than "Tikun Alum" in the Jewish tradition. For the US to sit back and squander our gifts while this inhumanely imbalanced war rages on now for almost one year I find to be inconsistent with the my own understanding of our nation's and my own moral obligations. 6- I am also finding it hard to get my head around how your position puts you in agreement with some of the regime apologists of the world like Ed Husain who are advocating for an "Assad-lite" because otherwise Syria will be run by sectarian violence, Al Qaeda, or chaos and thus the West pragmatically needs to side with evil; just the lesser of two evils. I know that is far from your position, and I know you have written extensively especially on Hafez Assad and you understand the evil that is the Assad regime, but this position puts you in line with the regime apologists is not consistent with what we did in Iraq, the Bush Freedom Agenda, and some of the core philosophies of neo-conservatism. Founding Member, Save Syria Now! 1- You assume that the Syrian people will appreciate American efforts to liberate them. I note how little Iraqis and Afghans remember what the U.S. government did and am arch skeptical. 2- Genocidal military machines exist around the world and the U.S. government does not fight them. Indeed, the Syrian one is minor compared to such horrors as in the Congo, where many millions have perished. I am in principle ready to intervene abroad – preferably using some form of foreign legion – but I am reluctant to do so in Syria, where our intervention will likely bring an enemy Islamist government to power. 3- I share your admiration for the United States and your wish to have our government stand up for individual rights and liberty. If I thought there were a good chance of an intervention in Syria leading to positive results, I would endorse it. But the Islamist future that looms ahead dissuades me. 4- If one followed the logic of your approach, (1) the U.S. military would no longer serve American interests but would become a full-time savior and (2) to be consistent, one would need to deploy it in the very worst humanitarian situations; according to one listing of failed states, there are 47 countries worse off than Syria, starting with Somalia, Chad, the Sudan, the Democratic Republic of Congo, and Haiti. 5- My two main points again: I fear intervention in Syria hastens Islamist rule and there are plenty of worse cases. 6- As you correctly note, I despise the Assad dynasty and its works. Yes, some unsavory types share my views on intervention. But others share your views: to take just one recent example, Hamas recently came out against the Assad regime. If you don't tar me with Ed Husain, I won't tar you with Hamas. However worrisome the prospects, I hope that the killing ends in Syria, the Assad regime falls, and a responsible, modern government takes its place. Feb. 28, 2012 update: Farid Ghadry of the Reform Party of Syria comments on this exchange at "Let Us Do Our Job." 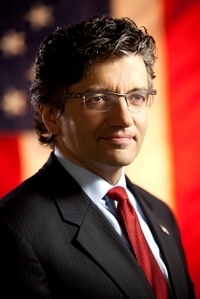 He endorses Dr. Jasser's views, arguing that "defeating Islamism will occur through the war on ideas. But how can you defeat Islamism by supplying it with oxygen in the form of tyranny?" 20% said get more involved. 50% said leave the situation alone.